Beat the Heat and head north for the WRT Poker Ride! It does not look like we have any trail projects on the calendar for the weekend of the 28th, so I thought I would share this poker ride flyer coming up the end of the month. If you have never been on a section of the Weiser River Trail, you are missing a great ride. The WRT is an old Railroad track that has been converted into a non-motorized trail for horses, hikers and bikers. Ive not been on this particular section of the trail personally, but I hear it is beautiful. 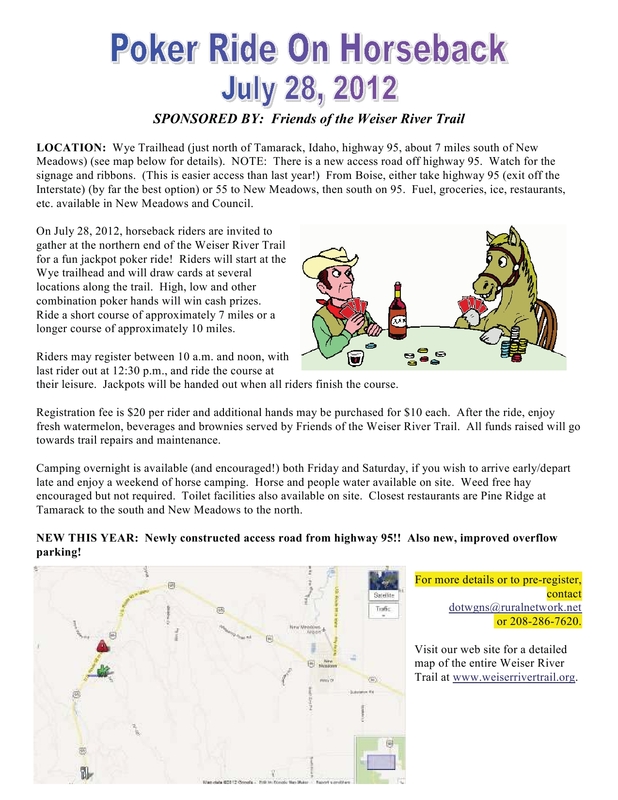 The flyer says they are encouraging camping for the weekend and all proceeds go to the Friends of the Weiser River Trail: the folks who maintain the trail.